The heat is on here in the Philippines as summer is almost upon us. The sun is always out and fans and air conditioners are most often than not in full blast just to beat the hot weather. People in our part of the world are now busy planning their summer getaway, myself included. I'll be taking a short road trip with friends by the end of the month to mark the beginning of summer. I have been doodling some ideas for that trip. But for now, let me share with you my very sunny nails. 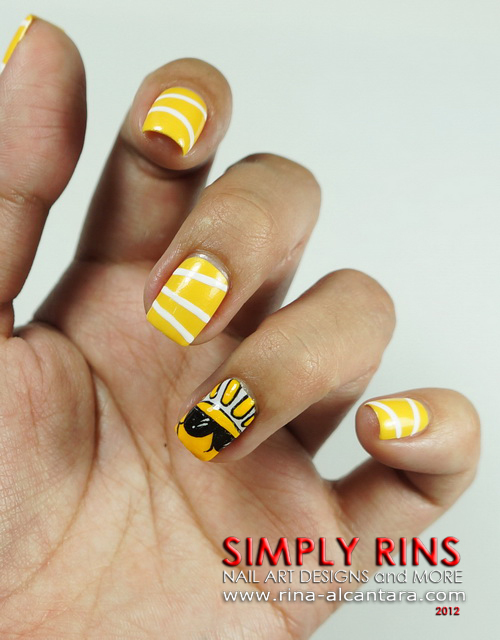 This is a hand painted nail design that features the sun ... wearing sunglasses. I am not particularly fond of wearing yellow because I've always thought that it will make me look pale. And as of this writing, I only have 3 yellow nail polishes in my stash. I was hesitant to paint all my nails yellow for that reason. But after polishing my nails, I felt it didn't look as bad as I expected. Or was that because the color is now very appropriate to summer? I painted 2 accent nails, one on each hand and decided on 2 coats of Sally Hansen Cloud Lavender as base color. As the name suggests, it is almost white with a very light purple tint. Application can be tricky and opacity is easily reached in 2 layers. As for my other nails, I wore China Glaze Solar Power in 3 coats. Its a golden yellow polish that I find perfect for this sun inspired nail art. Application can be tricky. Could be a 2 coater but decided to add another layer for full opacity. The entire design was painted using acrylic paints, detailing and striping nail art brush. I didn't want to leave the other nails really plain but I also didn't want to drown the sun so I opted for simple diagonal lines. Polka dots would have been a good choice too. I love summer and I love how this turned out. My nails are ready for the season! 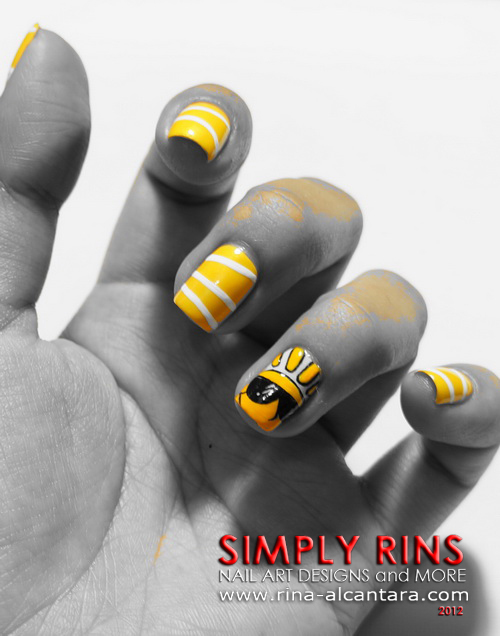 Penny for your thoughts, how do you feel about this sunny nail art design? I love the sunny nail art. It's bright and refreshing, and not something yu generally see. I like the single color photo also - very cool - adds an interesting variation to the mix! This one is perfect! I love summer, too! Love it!!! It's bright and well sunny.... :), and well done as usual. i love summer nail arts, can you please do more like this? Thanks for sharing such beautiful Garden EMb.